Undoubtedly, one of the most interesting parts of EVS is the on-arrival training, which predominantly aims to direct and prepare new volunteers for their oncoming ventures. Sounds a bit official, I know, but truth be told the essence of this “directing” and “preparing” lies within a set of non-formal and fun activities which coincidentally ensure that the memories be long lasting, useful and treasured from a number of points of view. Having arrived to Žilina in the afternoon, a rather fun trip I dare add, I, without a further ado, easily got to the hotel from the bus station which was thankfully located just a few hundred meters from the stop. After a bit of settling in, I realized I was in fact one of the first ones to arrive, the others started arriving a bit later. Having some free time I decided to explore the town a bit, although it seemed a bit “industrial” at first, the impression was short lived and completely dismissed as soon as I discovered the incredibly beautiful and well looked after architecture that’s more than a hundred years old. At five in the afternoon It was time to start with getting to know one another, this being the first part of the program, it carried the goal of ice-breaking for the fresh volunteers from around ten countries (e.g. from the Central American Honduras, to Caucasian Georgia, to West European Netherlands). We soon found out that we bore an impressive range of projects such as, but not limited to, Gypsy minorities and horses in a distant village. Of course my own project was rather a point of interest as well, not only for the other volunteers but also for the trainers and organizers who curiously asked about the project of E@I and also regarding Esperanto in general. Apart from lengthy games designed to get to know each other better and presentations of our volunteering programs, one of the most interesting and at the same time, tiring tasks were the town games (which we decided to undertake instead of a trip out of town) which included a hefty and active list of tasks where one had to, by oneself, find various places in the entirety of the town’s center and at the same time communicate with the locals using, according to one’s ability) Slovak (however it was quickly noted and decided that the international language English was sufficiently wide-spread). The games not only brought us closer to the town’s folk but also supported and strengthened our sense of teamwork which is a key skill of volunteering. One of the most interesting activities was indeed the presentation of the country, done by the organizers; they wanted to present Slovakia to such a flamboyant and background-rich group of young volunteers, using non-formal, interesting ways, so that the presentation itself could be much more awe-inspiring and curiosity-piquing. Sure as the fact that the Sun rises, it is worth mentioning the final non-formal activity which was aimed at bringing the town’s nightlife to our attention and which effectively lasted till the early morning, mostly thanks to the multicultural attractiveness of the town. Certainly, the several day long training will remain one of the most memorable parts of my EVS. 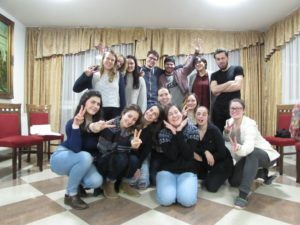 This article has been written by Lasha from Georgia who is volunteering in E@I thanks to the European Voluntary Service, financed by the European Union.